This was a product alert that came this afternoon with the Retro Groove Gym Bag (SPRI) featured in what looks like Pond, or maybe Snorkel Blue It’s Sprinkler! I don’t dislike this bag but I don’t love it the way I did most of the bags that were out ‘last year’ in ruched satin jewel tones. The inner liner is interesting, looks like Beachy Green and Pow Pink which have been spotted in stores. I wonder if this is ‘Ikat’ print mentioned in the Australian product alerts. 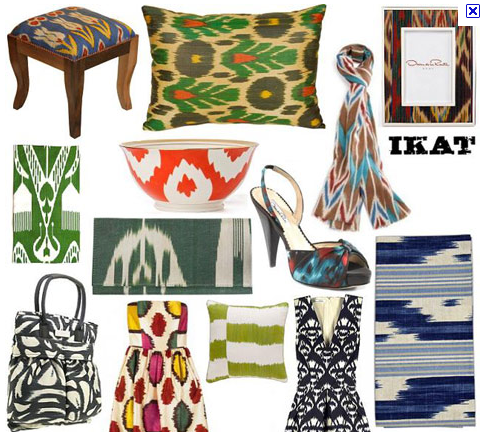 I found this example of Ikat Prints. The tribal folksy prints are in these days in local stores (Aritzia/TNA) so it’s interesting seeing that trend extend beyond the Poncho Print. "Newest Items ~ Great New Colors (Aruba, Raw Blue, Power Purple Micro Stripe)"
"A Few More Pictures ~ Ikat Print, Multi Poncho Stripe Hustle, Light Grey Pique"
sorry, commenting program is down for this post (comment entered before load time) so this post has the old commenting system instead. It takes a minute for the new commenting system to load but while it does that the old commenting system shows so occasionally someone will post a comment in the old system before it loads properly and then the comments that were there before disappear. That's what happened on this post. Not a big deal, it just means that those comments are now hiding. I'll see if I can copy paste them in here. Your right!! I've seen Sprinkler in the Australian product alerts but couldn't remember all of the blue color codes. If the SPRI after the name of the bag is coolod code, it may be Sprinkler. Thats what it looks to be, and the color code sounds like it as well. I hope it is, since I really like that color and am also VERY happy to hear about the return of pow pink.. hopefully. I missed out on it last time and have been anxiously awaiting its return! I was told by a reader that it was spotted in the Ala Moana store and I've also heard about other stores but can't remember which ones. I think it was just headbands or something small like that so I'm guessing that pink in the print is Pow Pink. Lulumum, did you say that pow pink has been spotted in some stores or that the print with the possibility of pow pink has been seen? I am obsessed with that color and anxiously awaiting it's return, so any talk of this being spotted makes me very happy! yes very hot right now, in all the home mags too in cushions etc. True Ikat is a real woven fabric, the prints mock that look. OMG your right. Ikat is a tribal looking woven print I've seen a lot of in local boutiques so this must be ikat print. It has that poncho, folksy look to it. I thinks it's Ikat which is a woven textile. how old should a person be to buy this bag…? and is it like a purse that you would wear to the mall or a yoga bag?